Yep, it’s the End Days for the 2008 summer vegetable harvest here in Eugene. Made tomato sauce with the rest of the ripe tomatoes and basil, and am now working on the green ones. The bulb sale last weekend featured a workshop on sharpening garden tools, and never having sharpened my garden tools, I thought I’d risk humiliation and bring ’em in. 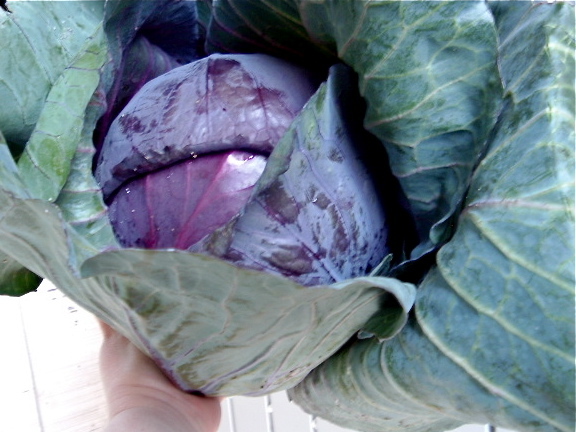 And wouldn’t you know it, I won a giant red cabbage — freshly hacked out of someone’s garden — as a door prize! I swear, my Polish magnetism pulls the cabbage out of anything. Anyway, since my Harsch crock was already full of green cabbage sauerkraut, I turned to my auxiliary jar, and mixed up a batch. I have a whole post about how to make sauerkraut here, but my notes are slightly amended below. I should also add that red cabbage tends to be less juicy than green, so if you can get freshly-hacked-out-of-the-garden cabbage, all the better. Cabbage stores well, as we all know, but the water content really drops as it sits in the crisper. My sources also say that late-summer cabbage is the best for turning into sauerkraut. Use 3 T. of canning salt per 5 lbs. of cabbage. Be sparing with the juniper and caraway, since it’s a pain to pick out the former and the latter really packs a flavor punch. After you slice the cabbage thinly, be sure to pound it down until there is a good layer of liquid over the cabbage to cover it completely in the crock or jar. POUND IT! THINK ABOUT THE ACADEMIC JOB MARKET AND MAKING $12K A YEAR IF YOU CAN’T GET A JOB! AND THE ECONOMY IS GOING INTO THE COMPOST PILE AND YOU THINK YOU CAN GET A JOB *NEXT* YEAR IN THIS CLIMATE?! AND YOU’RE 37 YEARS OLD! O YEAH! O YEAH! POUND IT! Oops, sorry, got a little carried away there. Remove all bits of stray cabbage you can find on the inside of the jar/crock above the water line, because they will mold. If you’re using a crock like mine above, follow the instructions that came with the crock. If you’re using a jar, make sure it will be big enough. There should be 5-6 inches of space on the top. Place a double-bagged gallon ziploc bag filled with brine (1.5 Tbsp. canning salt per quart water) atop the cabbage as a weight. Be sure cabbage is fully covered, but leave space at the top since the cabbage will exude more liquid over time and the jar may overflow. I place the jar on a tray in case of accidents. Cover open jar with a clean towel, then put a large brown paper bag over the entire jar to preserve color and vitamins. Store in a relatively cool place until done to your liking. I usually wait about 3 weeks in cooler weather. Hot weather will make it process faster. Check after a week or so and skim off scum from top, if necessary. And that, my friends, is how to make sauerkraut from a cabbage you won as a door prize. 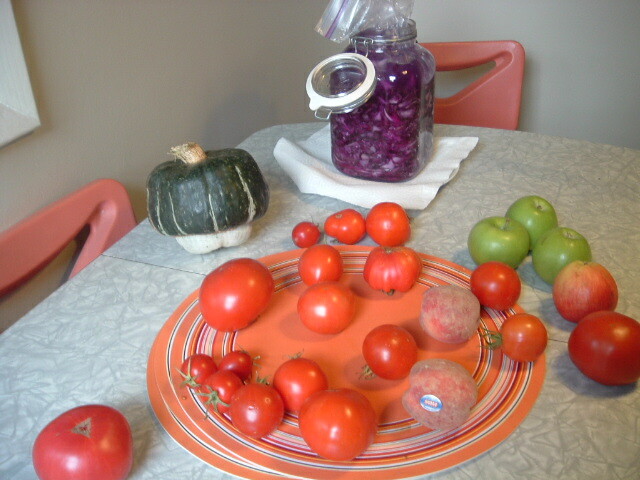 Eugenia- I am making my first ever batch of kraut and started about a week ago. I have some little bits of mold on the top of the liquid – should I toss it and start over? Thanks for your help! Amy: Nope, just skim them off. That’s pretty normal. What likely happened was that you had little cabbage bits that were floating on top. When exposed to the air, they became moldy. You might want to remove as many of the floaters as possible when you have the crock opened. I always check to make sure everything is submerged under the liquid. It might also help not to open the crock that often. I usually don’t get around to checking it until after a few weeks.